221 Items. Showing Items 211 thru 221. Available in 14k yellow or 14k white gold for 3mm chain. A heavy, solid constructed 6.25x1.74mm closed bail. Available in 14k yellow for 2.75mm chain. Closed ring which can be cut open or used with a connector jump ring. 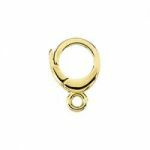 A 14k yellow gold bail for up to a 2.0mm chain. Having a closed ring which can be cut open or used with a connector jump ring. Available in 14k yellow, sterling silver and 14k yellow gold filled for 3.5mm chain. Easily snaps on to lockets or pendants with no solder needed. Available in 14k yellow, 14k white, sterling silver and 14k yellow gold filled for a 2.5mm chain. Easily snaps on to lockets or pendants with no solder needed. Perfect for chains 2.0mm in diameter of less. Easily snaps on to pendants and jump rings with no solder needed. Available in 14k yellow, gold filled or sterling silver.